Posted by Ken Briodagh & filed under IoTEvolution, MWC2016, MWC. 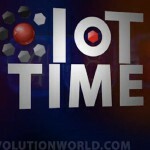 In this episode of the IoT Time podcast, Ken Briodagh, editorial director of IoT Evolution, sits down at Mobile World Congress to drop some knowledge on y’all about IoT Evolution’s editorial vision, what he learned at MWC and what you can expect for the next year. Tweet us @KenBriodagh and @IoTEvolution.